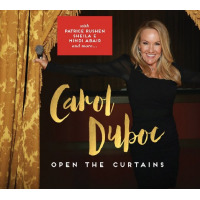 Jazz vocalist and pianist Carol Duboc delivers her eighth solo album presenting seven vibrant originals and three cover tunes on a set of jazz, R&B, funk and Smooth-styled music on the exciting Open The Curtains. Making this a special recording for Duboc, the singer illuminates the power of women by assembling an all-star, talented cast of female players including Patrice Rushen, Sheila E, and Mindi Abair among others. The result of course, is a collection of hard-driving soulful songs with an appreciable groove propelling the music forward. The gyrating and percussive "In Pieces," starts the ball rolling featuring the Afro-Latin funk sounds of Sheila E pounding the rhythm as saxophonist Abair extends herself on a burning solo, the song was inspired by a partnership that didn't go well and the tune is meant to convey the act of bouncing back and not falling to pieces. "Feeling Good" is one of the covers of the set and a tribute piece to the great Nina Simone, in which the singer voices the lyrics with emotion and a bit of soul. The title track brings out the funk-side of the leader as she and the ladies who provide the background vocals, reveals what's behind the curtains: high-octane funk and superb piano work by Rushen. Having perhaps one of the finest melodies of the session, the light "Whisper" is one of the standout songs of the album featuring Rushen on Fender Rhodes, Bibi McGill on guitar, bassist Rhonda Smith and Cora Coleman (Queen Cora) on the drums. All the ladies seem to get into the action on the fast-paced swinging and R&B-styled "Faces," a personal favorite of the leader that here, provides one shoulder-moving statement. The vocalist sings one sultry and seductive rendition of the classic "Fever," showcasing Aubrey Logan on the trombone and Queen Cora on the drums. The Queen is also on tap on the hard-driving "Miss You Missing Me," as Duboc belts out the lyrics and the drums pound out the beats on another upbeat and lively song. The music begins to close on the delicate and smooth-styled "Precious" highlighted by Abair's soothing soprano saxophone voice and comes to an end on the funky/R&B-tinged finale "I'm Gone," as the songstress reaches and provides a graceful exit. 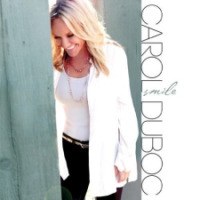 A gifted singer and composer, Carol Duboc unveils an enchanting and tasteful selection of songs designed to get one moving and bopping your head when you Open The Curtains, well done! Track Listing: In Pieces; Feeling Good; Open The Curtains; Forget Me Nots; Whisper; Faces; Fever; Miss You Missing Me; Precious; I'm Gone. Personnel: Carol Duboc: vocals; Patrice Rushen: piano; Fender Rhodes, synthesizer, organ; Cora Coleman (Queen Cora): drums; Rhonda Smith: upright bass, electric bass; Sheila E: percussion; Mind Abair: tenor saxophone, soprano saxophone; Bibi McGill: Guitars; Jennifer Batten: Guitar (6, 10); Aubrey Logan: trombone (7); Anna Duboc: background vocals (3); Ava Dela Cruz: background vocals (3).